Will giving your students more structure make them need more structure? One of the arguments against offering students practice opportunities online and providing automated feedback right then and there is that that way, they will never learn to work independently. Since I am working on e-assessment a lot and with many different courses at the moment, this is a fear that I definitely need to take seriously. I don’t believe that the danger is as big as it is sometimes made out to be, but I do believe that there is a vicious circle to be aware of. It all starts with the instructor having the impression that students are not able to organize their learning on their own. Since the instructor wants the students to succeed, she offers them a clear structure, possibly with bonus points or other kinds of rewards, so they have a safe space with instantaneous feedback to practice skills that are required later. So far, so good. Now the students are given this structure, and get used to working on problems that are presented in small portions and with instantaneous feedback. They start believing that it is the instructor’s job to organize their learning in such a way, and start relying on the instructor to provide both motivation and bite-sized exercises. Which the instructor, in turn, notices and interprets as the students becoming less and less able to structure their learning. At this point it is very easy to fall in the trap of trying to provide an even better, more detailed, structure, so that the students have a better chance of succeeding. Which would likely lead to the students relying even more heavily on the instructor for structure and motivation. 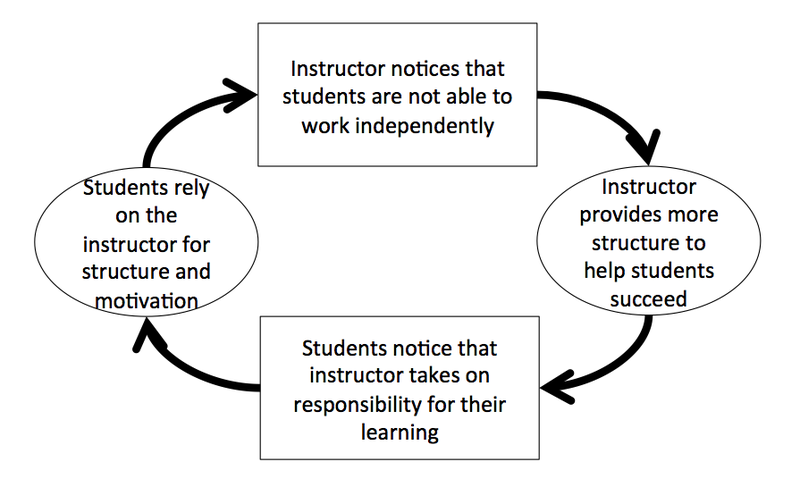 It is easy to fall into a vicious circle where the instructor feels like they need to provide more and more structure and motivation, and the students feel less and less responsible for their own learning. So what can we do? On the one hand we want to help students learn our content, on the other hand they also need to learn to learn by themselves. Can both happen at the same time? I would say yes, they can. The first step is recognizing the danger of entering into this downward spiral. There is absolutely no point in hoping that the students will take the initiative and not fall into the trap of relying on us, even if we point out that the trap is there. Of course they might not fall in, but whether they do or not is beyond our influence. We can only directly influence our own actions, not the students’, so we need to make sure to break the spiral ourselves. The second step is to make sure that we resist the urge to give more and more detailed exercises and feedback. The third step is to create an exit plan. Are we planning weekly quizzes as homework that students get a certain number of bonus points for? Then we should make sure that over time, either the number of bonus points will decrease, the time interval will become longer, the tasks become more difficult, or a combination of all three. The idea is to reward the behaviour we want just long enough that students establish it, but not any longer than that. And of course, last but not least, instead of giving students more structure, we can help them learn the tools they need to organize their learning. Be it training skills to organize yourself, or helping them find intrinsic motivation, or teaching them to ask the right questions so they can walk themselves through complex problems until they find an answer. It’s a pretty thin line to walk, and especially the fourth step might really be out of an instructor’s control when there is a lot of content to go through in very little time and the instructor isn’t the one deciding how much time is going to be spent on which topic. Most TAs and even many teaching staff won’t have the freedom to include teaching units on learning learning or similar. Nevertheless, it is very important to be aware of the vicious circle, or of the potential of accidentally entering it, to be sure that our best intentions don’t end up making students depending on us and the structures we provide, but instead make them independent learners. Liked it? Tell others about it! This entry was posted in Uncategorized and tagged e-assessment, learning, learning learning, mathematics, mechanics, method, online learning, teaching, vicious circle on November 18, 2015 by mglessmer. 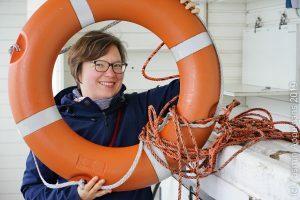 Receive notifications of new blog posts on kitchen oceanography, wave watching, or other "adventures in oceanography and teaching"! Adventures in Oceanography and Teaching by Mirjam Sophia Glessmer is licensed under a Creative Commons Attribution-NonCommercial-NoDerivatives 4.0 International License.